Here’s a fun little tune to use as a break in the middle of class. Students just listen to the words and follow the instructions. Make sure their chairs are a little bit away from their desks; otherwise it will get very noisy standing up and sitting down. Watch the video. 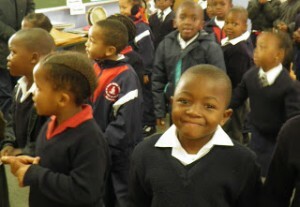 It was recorded in a primary school in Wellington, South Africa in June, 2012. My students and I really enjoy all the listening games I hope there will be more in the future, specially if speed is involved!